The red chair in MOA, commemorating the longest home-run hit in Twins history, by Harmon Killebrew at Met Stadium (where the Mall of America now stands). Harmon Killebrew has cancer,* and they don’t even move Twins Fest to Mall of America? Killebrew Drive? On top of Old Met Stadium, where he and the Twins and the Vikings played? Hello? I haven’t been to Mall of America in a few years, but I can’t imagine there isn’t empty space there. Seriously, has anyone been on the 4th floor of MOA lately? I bet there’s a lot of space up there. The Twins must be scaling back this year’s Twins Fest activities in light of the Metrodome Collapse. Personally, I was really looking forward to visiting my beloved Metrodome, so it’s a real bummer. But they could have made it big at MOA. Even I feel like I should go visit home-plate in the middle of the amusement park formerly known as Camp Snoopy. I suppose maybe (?) the crowds will be smaller in Blaine—if I make it out there? Seriously though—why didn’t they have it at Mall of America? * I’ve been a little emotional about this all day, and am not ready to address it yet on my blog. Thanks for understanding. If you are feeling charitable, give to the Harmon Killebrew Foundation. I have gone to his charity golf tournament banquet, and I know his foundation really does a great job helping disabled children, so it certainly is worth giving to. Guess what—the Japanese are even reading Aaron Gleeman now too! Although they seem to think Gleeman's .275 BA hopeful expectation for Nishioka funny. The Japanese media has been very impressed with what we would call “Minnesota Nice.” While Nishioka was visiting Minnesota this past week, many Japanese media outlets reported about the awesome VIP treatment he received. One news outlet proclaimed that we gave Nishioka the best welcome any Japanese player has ever gotten—and all of this was particularly because GM Bill Smith himself drove Nishioka around during his visit. (西岡に超異例のＶＩＰ待遇！ツインズＧＭが運転手に！！ (“Oka Nishi extraordinary super VIP treatment! GM Twins are the driver! !”)) This article said they had never heard of a GM himself driving players around, that Nishioka was very happy, and then described the reception past Japanese stars have received in America—all involving large crowds and police escorts. Hmmm… I guess police escorts aren’t soo welcoming? The Japanese also reported that Tozawa Hidenori—the head chef at Nami restaurant, near Target Field—has created the “Rock’n Roll” sushi roll in honor of Tsuyoshi coming to the Twin Cities. The restaurant is reportedly Ichiro’s favorite place to visit here in the Cities. The Japanese media was also impressed with Gardy bringing his “Survival Japanese” book Nishioka’s press conference. Andrew from Off the Mark posted a few weeks ago that the organization gave Gardy lots of Japanese language learning tools for Christmas. And it might be a good investment—I came across a headline reading “小林宏もツインズ！？打診認めた” (“Hiroyuki Kobayashi Twins too!? Consultation revealed”). A fellow-teammate from Tsuyoshi’s champion Chiba Lotte Marines is also looking to come to the U.S., and apparently the Twins expressed some interest. And good news if it’s true—Hiroyuki is a relief pitcher, something the Twins really need! Is this guy any good? Might as well get our money’s worth from the Japanese translator! Anyways, it sounds like Nishioka and his wife really enjoyed their visit, and—despite the freakish large amount of snow—are looking forward to living here. Nishioka’s wife, Tokuzawa Naoko, is a famous Japanese model. The couple spent Saturday searching for a new home in Minneapolis. Nishioka also expressed interst in coming back to the Cities for Twins Fest at the end of Janurary—which brings up the inevitable question of whether the Metrodome will be ready in time. I personally hope so. I would love to go back and visit the dome, and I bet our new Japanese friends might like it too. Remember the video I posted of Nishioka playing in the bizarre-o Metrodome? That’s actually the Tokyo Dome, and it was inspired by the Metrodome! I told you Japanese fans are the best! I'm also officially addicted to Google Translating Japanese media reports. According to LEN3, the Twins will have a press conference TOMORROW at 4PM! Old news over here at Kirby's Left Eye! Tsuyoshi is most likely back at his hotel now after visiting Target Field. Fifteen or so Japanese reporters waited for him outside. At least one Japanese news outlet is reporting that Tsuyoshi loved Target Field, is excited to play there, and is determined to exceed expectations. TSUYOSHI NISHIOKA (arrived and practically signed in Minnesota)!! Who cares about all the endless Vikings drama? But he also said, “I’m very excited to be here. 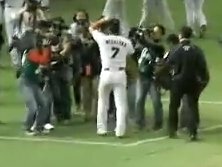 I already have my number picked out.” (Nishioka was number 7 in Japan, so he will be taking on a new number). Although not officially confirmed by the Twins, Nishioka and many outside sources have confirmed his contract with Minnesota. Sources say the Twins will officially announce the signing tomorrow or Saturday. Nishioka, 26 years old, was the Japanese batting champion in 2010 for the Chiba Lotte Marines, and has won the Japanese equivalent of the Golden Glove at Second Base and Short Stop. Tsuyoshi has expressed a great desire to play for the Twins. After searching characters from the article sent to me, I've found many other Japanese news articles with some more information. This article seems to indicate Tsuyoshi knows the bloggers are weary of him because he is unproven, but he is determined to change that and impress the fans. This article seems to indicate Tsuyoshi saw the video of the Metrodome roof collapse and he had some concern over the cold. It also says that Tsuyoshi was always aware Joe Mauer had number 7, and that he seems to think getting a new number on a new team isn't a big deal. (The accompanying picture proves that he does in fact have a very hot model wife). In this article, Tsuyoshi apparently says that he thinks the biggest adjustment for him will be playing on natural grass. All the teams play on turf in Japan. This article says that when Nishioka asked about the Twins and was told the Twins are contenders almost every year, Nishioka was very excited. It also talks a lot about how Nishioka will likely face Boston Red Sox Pitcher Matsuzaka in his first exhibition game as a Twin in spring training. Matsuzaka says he is excited for the Japanese matchup. The article also includes a quote from "Gadenhaia director," something about battling tails off. 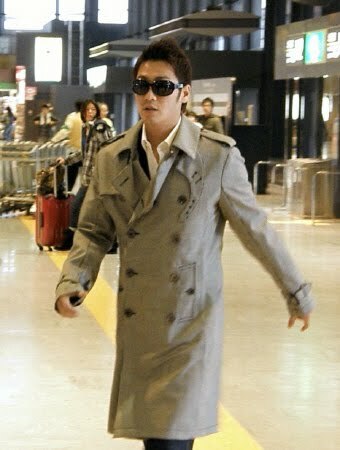 And HERE is a video of Tsuyoshi arriving at Minneapolis-St. Paul International. Some idiot asks Tsuyoshi a question in English. The video also shows pictures of all the snow, and Tsuyoshi was surprised by everything being so white. There are also lots of bewildered Minnesotans in the background wondering what the hell is going on. THIS IS SO FUN! Do I really get to pseudo translate Japanese news articles for the next three years? This Japanese news site is now reporting the deal is final and the press conference will be held tomorrow at 4pm. Let us see how well Japanese reporters and Google translate actually work. I remember meeting Bob Feller at least twice, at two different Twins Fests. He came to Twins Fest with his own table, representing the Baseball Hall of Fame (I think?). Not many knew who he was, so you could stand there and talk to him. Awesome, awesome guy. Rest in peace, Bob Feller. Ever Wonder What It Looks Like Inside the Metrodome while the Roof is Collapsing?